Ban the Gun! Ban Free Speech! Ban the food kids like to Eat! Ban the Car, then Ban the Boat! Ban the peoples right to Vote! That Hell ain’t Hot and Rocks don’t Fall! Then we’ll all be good ‘lil Sheep! We’ll all bow down and Kiss your Feet! Of People who won’t stay inside the Wall! Evil exists in our world. It always has and always will. Throughout history evil people have committed evil acts. We can not legislate evil into oblivion. Good people will abide by the law and defective people will always find a way around it. Evil exists all around us. The largest mass killings of the 20th Century were committed by Governments against a previously unarmed public! Therefore, the greatest human tragedies on record can be attributed to governments. Who do governments target? “Scapegoats” and “enemies” within their own borders … but only after they have been disarmed to the point where they are no longer a threat. Ask any Native American, and they will tell you it was inferior technology and lack of arms that contributed to their demise. 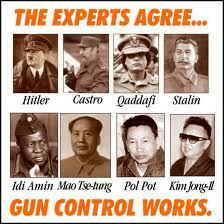 exterminate millions of them, and they will answer, “We were disarmed before it happened”. Ask any Jew what Hitler’s first step prior to the mass murders of the Holocaust – confiscation of firearms from the people. These tragedies are why the Second Amendment exists, and why we shouldn’t be in such a hurry to surrender our Right to Bear Arms. Without the Second Amendment we have no right, and no means, to defend ourselves and our families. AMEN. Everyone should go to YouTube and watch “Innocents Betrayed-The True Story of Gun Control”. History doesn’t lie, but it will be repeated if people don’t learn the truth and act accordingly.